The boil over lid is a silicone hob and stove top protector designed to prevent hot liquid spillages while cooking food from CKS Zeal. 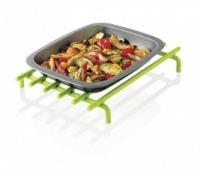 Designed to prevent boiling milk, vegetables, pasta or rice from bubbling over. Universally fits a variety of pans from 15cm milk pan to 25cm saucepans (6" to 10") to prevent overspills on all size cooking pots. This cooking lid is safe to leave while preparing other parts of your meal, happy in the knowledge that it will not boil over and make a mess of the cooker top.